Chris is a man who wears many hats for Silvertip Films. He is one of our in-house video director producer talents but he is also a Cinematographer. Chris has had a passion for film and story telling since an early age that led him to a dream of producing and directing feature films. Chris sites filmmakers such as Alfred Hitchcock, Michael Mann, Sidney Lumet, Jan Nemec, David Slade and David Fincher as influences on his visual and directing taste. 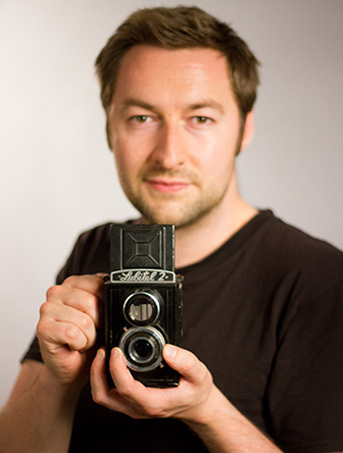 He is a fan of photographers such as David Bailey, William Eggleston and Joel Meyerowitz. Chris has recently been shooting and directing the Phaidon Press interviews for Silvertip Films. He has also been director of photography on numerious music videos including ENV’s ‘When the night’ and Serena Kern’s ‘My Promise’ and ‘I lied’. He also Produced the ’Big Brew’ viral animations for Spinal Research. Producing an animation was a professional goal for Chris and he is incredibly happy and proud of the finished project, as was our client. Chris has recently directed, produced and written his first film a spy thriller called ‘The Dry Cleaner’, which he hopes to release soon. Chris has previously co-produced the television documentary ‘Chris Petit: Scene from the other side’ for Sky Arts, he also co-produced the Webby nominated and W3 Award Winning music video ‘Thomas Dolby’s ‘The Toadlickers’ and he produced the short film ‘Victims’ which had its screenplay nominated for a Scottish BAFTA in 2011. Chris's favourite film is Manhunter (1986).